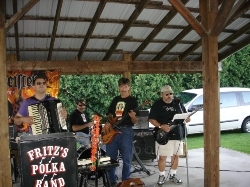 Fritz, Mike Farraino (special guest drummer), Frank, and Gabe are pictured here on August 20th in New York Mills, NY. 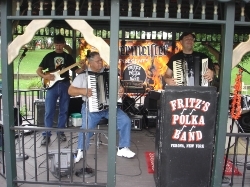 Frank, Fred, Fritz, Mike Farraino (special guest drummer) and Gabe are shown here during FPB's gig at Pulaski Park in New York Mills, NY on August 20, 2008. 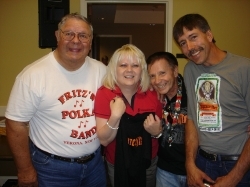 After FPB's gig wrapped up at the Colonial Square Summer Concert Series on August 13, 2008, Fred, George, and Frank presented Cindy with a Jagermeister shirt. 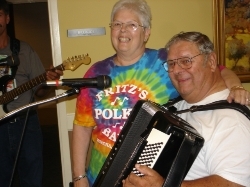 Nancy (Fred's wife) and Fred are all smiles, prior to Nancy singing 'Johnnie's Knocking' with Fred and FPB on August 13th in Utica, NY. 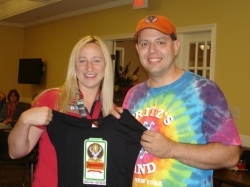 Fritz presents an FPB/Jager stretchy shirt to Carrie Moulton, prior to FPB's gig at the Colonial Square Summer Concert Series on August 13th. Carrie booked FPB for the gig (Thanks, Carrie!). 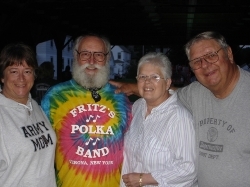 Fred and his wife, Nancy, are shown here with (L-R) FPB Fan Club Members, Sue Sigsbee and Nick Dudish, after FPB's gig on August 12th wrapped up. Earlier in the night, FPB dedicated a new song called 'Tribute' to Sue, which was written to honor Sue's son, Corporal John Sigsbee, who was killed in Iraq in January 2008. 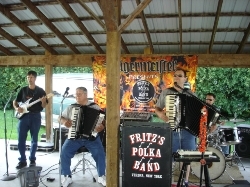 Fritz and George are shown here tearing through a tune on August 12, 2008 in New York Mills, NY. 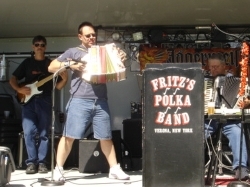 Frank, Fred, Fritz, and George are pictured here during FPB's gig at Pulaski Park in New York Mills, NY on August 12th. 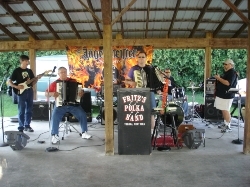 Frank, Fred, and Fritz are pictured here performing at Utica Monday Nite on August 11, 2008 in Utica, NY. 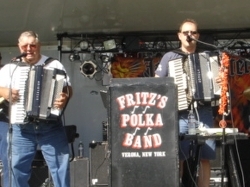 Fred and Fritz are shown here during FPB's third set at the Mohawk Field Days in Mohawk, NY on August 9th. 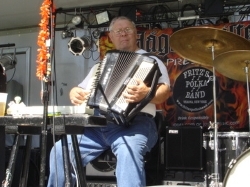 Fred and the Sonola on August 9th during FPB's second set at the Mohawk Field Days. 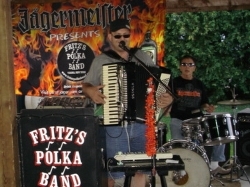 Frank, Fritz and Fred are shown here during FPB's second set on August 9, 2008 at the Mohawk Field Days. 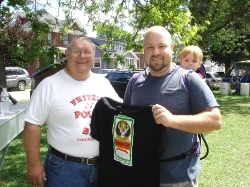 Fred presents an FPB/Jager t-shirt to Jason Clayton, prior to FPB's first set at the Mohawk Field Days on August 9th. Jason booked FPB for the gig (Thanks, Jason!). 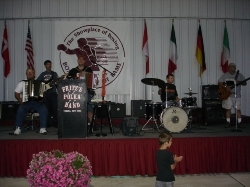 Fred, Frank, Fritz, George, and Gabe are shown here at the International Boxing Hall of Fame in Canastota, NY on August 7, 2008. 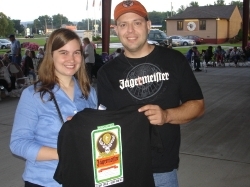 Fritz presents an FPB/Jagermeister t-shirt to Lynn from the Oneida Daily Dispatch, as she was covered FPB's gig in Canastota, NY on August 7th.